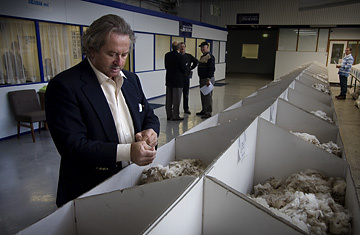 Pier Luigi Loro Piana inspects samples of Merino wool at the Australian Brooklyn Wool Auction. Until the day I met him last fall in Sydney, Australia, all I knew of Pier Luigi Loro Piana, co-CEO of the Italian luxury brand, was what I had heard from friends in London, Paris and New York who are all fanatics about his company's products  and from the glossy tabloid photos of Loro Piana posed with the cream of European society, or racing his 84-ft. sailboat off Capri. The brand was started by one of Loro Piana's ancestors in 1812 as a textile company that later supplied most of the world's top fashion houses with the finest wool and cashmere. Today Loro Piana also makes clothes and accessories like the delicate linen André shirt, the Roseto cashmere shawl and the brand's signature Globe Bag for people who, Loro Piana says, "want the absolute highest quality." When I was invited along with a handful of journalists to travel Down Under to witness first hand the places where Loro Piana cultivates its superfine merino wool and spins it into cult clothes like the cuffs and collars of the Horsey jacket, first created for Italian riders in the 1992 Olympics, I wondered what itchy wool had to do with Italian luxury. Little did I know we were in for the road trip of a lifetime, a grueling trek across the Antipodes in an almost obsessive search for the world's finest raw materials. Nor did I realize that such a search would involve 18-hour days hanging out with sheep. Loro Piana himself may be the epitome of European refinement, but my suspicion that he would remain very much above the muddy fray as we trooped around sheep stations in far-flung Australian and New Zealand valleys was way off the mark. It was a struggle to keep pace with him. At 56, Pier Luigi is the younger brother of Sergio, 59, the taller and more tycoon-like Loro Piana, with whom he swaps chairmanship every three years. The brothers could easily have whiled away their careers as the spoiled heirs to the Milan-based textile and fabric dynasty that is one of the biggest importers of luxury cashmere and wool in the world. Instead they have built their sedate family company into a highly respected global luxury brand with sales of $613 million in 2007. They opened their first store in New York City in 1993, and today there are 108 Loro Piana stores worldwide. The retail business, which also includes a new home-furnishings line, makes up 60% of total sales. The newest Loro Piana outpost will open in Beijing just in time for the Olympics. Photos of the two brothers often show Pier Luigi slightly overshadowed by his older brother. But Pier Luigi is known as the Marco Polo of the family, the one who leaves the company's massive headquarters outside Milan to crisscross some of the most remote areas of the globe, forging and nurturing friendships with the people who provide the company with the world's best wool, cashmere (Mongolia) and Vicuña (Peru). In Australia and New Zealand, the company holds a contest every year to see which of their breeders can come up with the finest merino wool. They are called record bales, and some reach extremes of refinement, with fibers currently less than 12 microns. Fiona Gardner, a New Zealand sheep farmer who breeds black sheep in a storybook setting on the South Island, calls Loro Piana "God." She approached him in 2002 with the crazy idea that he should check out her ultrafine black-sheep wool, which any traditional sheep breeder would consider a contamination. Loro Piana liked what she sent him so much that he created an entire line around it, called Pecora Nera, Italian for black sheep. Gardner may be devoted to Pier Luigi, but Pier Luigi says his guru is a 94-year-old master Saxon merino sheep breeder named Donald Burnett, who lives in an isolated cottage at the foot of Mount Cook. We flew in to see Burnett in helicopters, landing on his lawn. "This man taught me everything," said Loro Piana, introducing me to Burnett. "He's still teaching me." In turn, Loro Piana became my wool guru, correcting my misinformed idea of the raw material as itchy and ol�d-fashioned and teaching me how to count the microns in a bale of a wool at the remote Ledgerton Farm outside Canberra. The lower the number of microns, the silkier the wool, he counseled, lovingly caressing the fleece. I began to realize, as I bottle-fed baby sheep at a farm in Tumbarumba, Australia where last year's record 11.6 micron bale was produced, that this is not the kind of wool I remembered from the Fair Isle sweaters I wore in high school. And so my education continued, even in what would seem the mind-numbing environs of a wool auction in Melbourne. Loro Piana, always the last one at the bar at night and the most energetic one in the morning, stood transfixed before a football-field-size room filled with bales of wool. "Fantastic," he muttered, lost in the glory of a silky yet superstrong strand of 12-micron fleece as he proudly demonstrated the thread's resilience, pulling on it as he tried in vain to tear it in two. That's why, when our boondoggle was over, I called Loro Piana the man who pulled the wool over my eyes. We were on a yacht in Auckland Harbor on the last day of our trip, and Loro Piana was regaling the group with stories about the history of Saxon sheep, a type of merino. I realized I was engrossed in a topic that had never interested me. "How could you not be interested?" Loro Piana said in genuine amazement. "These animals, and the beauty they produce, it's one of the great stories."